My second collection of poems, Sanderlings (Tupelo Press, 2011). Geri Doran is the author of three poetry collections—Resin, Sanderlings and the forthcoming Epistle, Osprey (Tupelo, 2019). Her work has been recognized with an Amy Lowell Poetry Travelling Scholarship, a Wallace Stegner Fellowship, and the Walt Whitman Award of the Academy of American Poets. She has also held residency fellowships at the James Merrill House, Maison Dora Maar in Provence, Lighthouse Works, Millay Colony and Vermont Studio Center. Individual poems have appeared recently in New England Review, Yale Review, Southwest Review and other journals. Her new book marks a shift toward a quieter poem in a more natural form. Contemplative and disquieted, the poems of Epistle, Osprey trace the mysteries of encounter, wanderlust, rootedness, the human relationship with nature, and our uncertain place in world and cosmos. 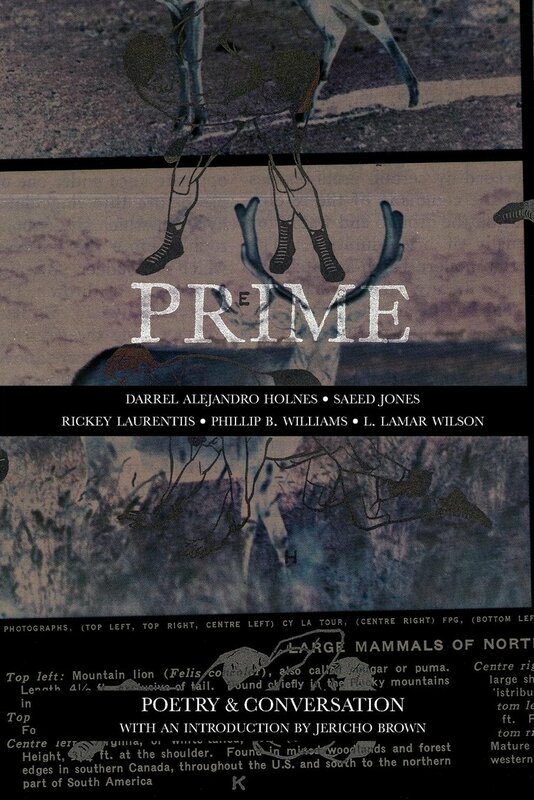 Prime: Poetry & Conversation is a first-of-its-kind document of poetry and ongoing conversation in the black, queer literary community, a necessity as the historically well-indexed canon of white queer writers continues to grow with little diversity. Sparked into existence by a Best American Poetry blog from Jericho Brown in which he singled out some of the most exciting young, black, and gay men writing today, Prime features poems by and dialogue between poets Darrel Alejandro Holnes, Saeed Jones, Rickey Laurentiis, Phillip B. Williams, and L. Lamar Wilson. Jericho Brown provides the introduction for this collection, which is proudly published by Sibling Rivalry Press. Darrel Alejandro Holnes is a recipient of a 2019 National Endowment of the Arts Creative Writing Fellowship in Poetry and fellowships or scholarships to Bread Loaf Writers Conference, Cave Canem, CantoMundo, and other creative writing programs. His poetry has been awarded the C.P. Cavafy Prize from Poetry International and his poetry was a finalist for the National Poetry Series, BOAAT Poetry Prize, Cave Canem Poetry Prize, Pushcart Prize in Poetry, Gwendolyn Brooks Poetry Prize, Brittingham & Pollak Poetry Prizes, Split this Rock! National Poetry Prize, the “Discovery”/Boston Review Poetry Prize, Pablo Neruda Prize in Poetry from Nimrod International Journal of Prose and Poetry, and others. His poetry has been published in American Poetry Review, Poetry Magazine, Callaloo, Best American Experimental Writing, Gulf Coast, and elsewhere in print and online.